India is looking to import pulses from Burma and African nations to counter a domestic shortfall of 7.6 million tonnes. Qatari telecom operator Ooredoo reports a 16.4 percent gain in second-quarter net profit, boosted by the performance of its businesses in Burma and elsewhere in Asia. Burma’s business community is eagerly awaiting an announcement this week from the ruling National League for Democracy about its economic policies. 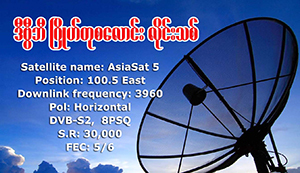 Broadband and mobile connections are set to improve in Burma’s capital and its largest city as two major providers of telecommunications services upgrade their offerings. Rights groups criticised the move, which they said would increase the risk of undermining political and economic reforms. Brisbane-based Metro Mining is one of the first Western mining companies to invest in Burma since a revised mining law was introduced late last year. The US-government-backed Overseas Private Investment Corporation launches operations in Burma with a US$250 million loan to a company that builds and maintains telecommunications towers. A bakery that teaches disadvantaged women the skills they need to succeed in the workplace is part of a growing trend towards social businesses in Burma. After months of delays, and concerns about suspended projects, the move sends a signal to investors that Burma is open for business. As imports soar in Burma’s booming economy, the country’s largest port struggles to keep up. The US decision to further ease restrictions on trading through Steven Law’s shipping port and airports put the blacklisted businessman in a position to profit from the latest changes to the US sanctions regime. The US government has decided to maintain most economic restrictions on Burma in an effort to punish those Washington sees as hampering the country’s newly elected government. Washington is expected to offer more general licenses to specific companies, and take some people off Treasury’s list of “Specially Designated Individuals” targeted for sanctions. All eyes are on the new NLD-led government for signs that it is ready to introduce economic legislation that will satisfy both investors and human rights advocates. Serge Pun may be unburdened by international sanctions, but his Mr Clean image has done little to help him clear domestic hurdles. Burma’s lack of skilled labour is one of the major hurdles facing the country’s economy, according to Thai academics. According to the President’s Office, the company gave the 5 million kyat bribe to the assistant of an unnamed official. The deal would be the biggest involving Burmese assets to date. Foreign direct investment in Burma during the fiscal year that ended in March totaled $9.4 billion for 217 projects, official data showed on Monday. The deal, approved before the National League for Democracy came into power last week, was announced on the same day as a visit by China’s foreign minister. Foreign direct investment in the fiscal year ending in March grew to nearly $9 billion, after a rush of last-minute approvals. The total value of trading on the first day of Burma’s new bourse reaches nearly US$3 million.